If your hand got stuck in a big rock in the middle of the Grand Canyon, when you've got bravery to explore this place, and you are alone for almost 3 days without a phone to call for help, and you also dont have any food for surviving in the quietest place, in the deepest land. A new film from the director of Slumdog Millionare, Dany Boyle will make you think about the preciousness of life, and the struggle for someone that you love, and a sacrifice. Telling about a nature explorer named Aron Ralston, you'll be brought into a Grand Canyon view that is a main location in the film, you'll see a reality of Aron's struggle againts a big rock that struck his left hand in a Grand Canyon hole. This movie was taken from true story, so if you think this movie such as an action film that has a happy ending without sacrificing, you wont want to see it. Finally, I think this film is like "Buried" a film that I watched last month, it tells about someone who is struck in a troubled condition, not on a big rock, but into the ground. 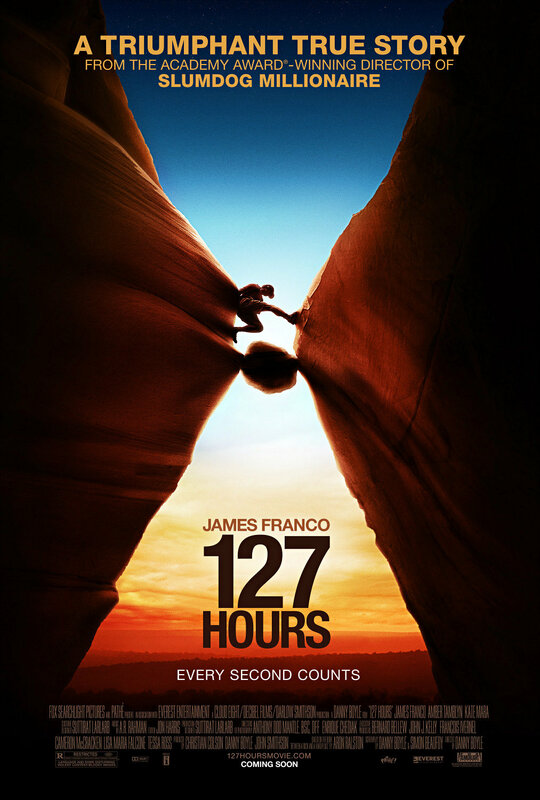 But, the difference of both of these movies is 127 Hours taught me how to respect our life. Thanks to: Mrs Kana Foutch for editing and revising this writing.